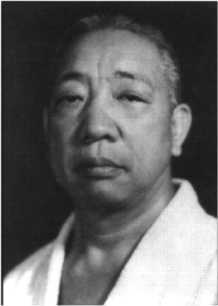 Our "Okugi" techniques are based on the founder of Danzan-Ryu Jujitsu, Professor Henry S. Okazaki. Prof. Okazaki taught his last "Okugi" course in 1948 in Honolulu HI, although he called it a "special class", not Okugi. The next special class was named Kodenkan Jujitsu Okugi® or Danzanryu Jujitsu Okugi™ by Prof. Sig Kufferath and Prof. Tony Janovich. They taught this class in 1993 in Campbell, CA. In his own words Prof. Kufferath said after the 1993 “Okugi” “It was better than 1948, more knowledge”. During the years after the 1993 class Prof. Kufferath and Prof. Janovich discussed the improvements they would make for the next “Okugi” class. Prof. Kufferath passed away in 1999, but the 2003 course outline was complete. Profs. Kufferath and Janovich decided that the course would be extended to 34 hours over 2 weekends. They added more courses and refined the entire package. Profs. Kufferath and Janovich also decided it would be an application process to get in. You must submit an application along with your course fee for approval. If you are not approved your check will be returned to you un-cashed. Prof Bob Hudson, 8th Dan: Graduate of Okugi 1993 and 2003 with title of "Shihan"
Prof George Arrington, 6th Dan: Graduate of Okugi 1993 and 2003 with title of "Shihan"
Imagine the experiences of a master...who learned from the master! Prof. Sig Kufferath began his study of Jujitsu under Prof. Okazaki in 1937, and earned a black belt in 1941. He had been teaching self-defense since 1942. Then, Prof. Kufferath continued his studies in the healing arts, graduating from Okazaki’s Nikko Restoration Sanatorium Seifuku Jitsu course in 1943. After Okazaki’s death, Kufferath was elected to succeed Okazaki as head and professor of Danzan-Ryu Jujitsu. He also held black belt rank in Aikido and Judo. Prof. Kufferath passed away May 7, 1999. At Kodenkan Jujitsu School, you have a rare opportunity to study with Prof. Kufferath’s longest active and highest ranking student Prof. Tony Janovich. Prof Janovich is the only instructor authorized by Prof. Kufferath to teach the “Kodenkan Jujitsu Okugi®” course. Professor Tony Janovich: 10th Degree Black Belt with 53 years of experience! Prof. Tony Janovich began his Jujitsu study under Prof. Kufferath at the age of 12. At the age of 5 he began studying under his father, a former Marine Corps hand-to-hand combat instructor. 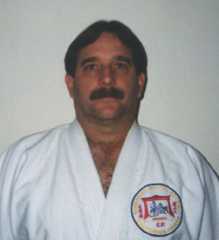 He is a 10th degree black belt and received his professorship in 1989. Under Prof. Kufferath he was guided and instructed through Danzan-Ryu Jujitsu including all the "Okugi" (advanced teachings) levels. In addition to the martial arts training he received, Janovich became a master of the Okazaki system of Restoration Therapy known as Seifukujutsu under the tutelage of Prof. Kufferath. Today he practices this Seifukujutsu as his vocation. As a police officer, he has taught for the Department of Defense, various police agencies and colleges. He has operated the Kodenkan Jujitsu & Restoration Therapy for the past 39 years. Prof. Janovich was the senior student and the chief instructor of Prof. Kufferath before Prof. Kufferath’s death. Prof. Janovich is the treasurer of a great storehouse of knowledge on the Danzan-Ryu kata, history and traditions, and also holds black belt ranks in Aikido and Judo. Kodenkan Jujitsu Okugi® Danzanryu Jujitsu Okugi™ is a trademark of the Kodenkan Jujitsu School and Tony Janovich.